Badminton Hero slot is very good and very bad in equal measure, a paradox which I'll explain in due course. The theme is featured around the sport of Badminton and is the first time I've seen it used and we get an inside court as our background with cartoon representations of various players and their equipment as the symbols. The soundtrack is slow beat music with the usual Microgaming start sound and gentle thuds as the reels stop, although these become more dramatic if a win sequence should occur. 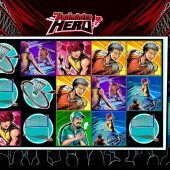 I should compare this Badminton Hero slot mechanic to some others at this juncture but to do so now will give the game away (well, I thought that was funny) so let's first see how our bankroll will fare when smashed across this court a few times. A grid of 5 reels and 3 rows is a necessity for a 243-way slot which is exactly what we get here. The 5-of-a-kind pays won't begin with Wilds as these only appear super-stacked on reels 3, 4 and 5 in the form of the game logo. Instead we get the Red Player awarding us 12x our 50-coin bet for a full way of 5, Yellow Player 6x, Green Player 5x, Blue Player 3x and Purple 2.5x. The equipment pays are Shuttlecock 120 coin, Trainers 100, Chart 80, Net 70 for a full way. You do get Gold Trophy scatters on all reels and these will pay 250x bet for all 5 but only 3 are needed to trigger the bonus. Before then we need to check out the game's in-play dynamic and random feature. 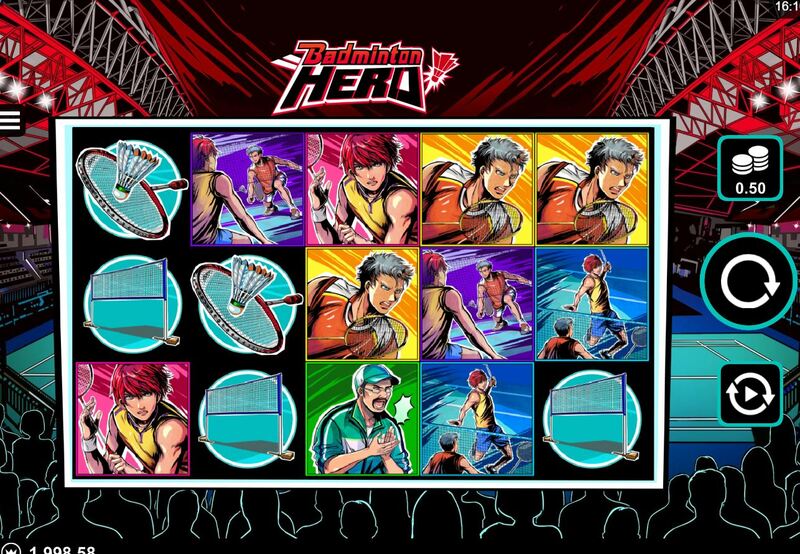 Badminton Hero features 'Rolling Reels' which means that all winning icons are removed to be replaced by additional symbols dropping down from above. This includes the Wilds on the last 3 reels but it is actually possible on occasion to see Wilds on reel 2. This is because randomly at the start of any spin you could be awarded any one or two of reels 2, 3 and 4 as Wild reels. Three or more Gold Trophy scatters will award 15 free games, with 20 for 4 and 25 for all 5. During these you will get an increasing multiplier on the actions during any one spin. These are 2, 3, 5 and 10x which is the maximum and will stay in place for all consecutive actions of 5 or more. You can't retrigger them but can get the Wild Smash random feature. If you get the 3 Wild reels in the right place for successive cascades some huge pays are possible!